Absolutely love these sheets. My son is obsessed with construction trucks so he was so excited to get these. Quality is great. They are super cute. Would absolutely recommend. These sheets came in very fast and are very soft! My son loves the trucks. They have washed up well and will be nice and cool for the summer. 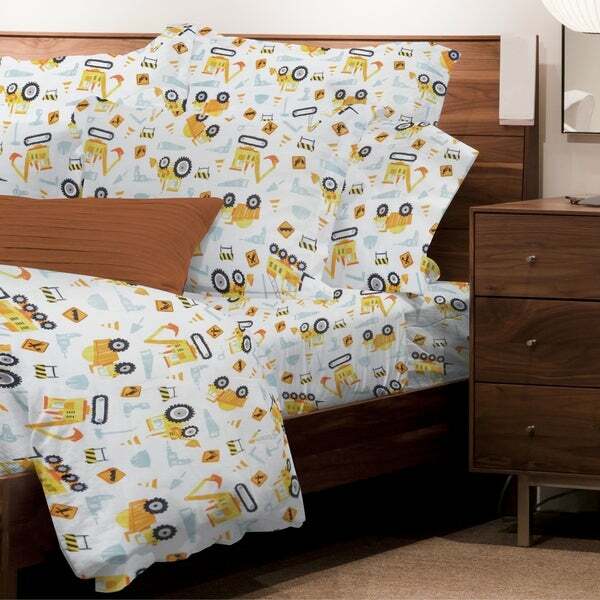 My grandson loves these sheets.He tends to sleep in his room more without sneaking into his parents. Soft to the touch. Design fades with each wash, elastic stretched out after first use, fabric had runs in it out of the packaging and continues to have problems running, and multiple seams have come out and required mending within 3-6 months of purchase. Don't do it. these don't seem to wrinkle in the dry which is great :) The fitted sheet, the pictures are sideways (at least on the full size) but my 3yr old doesn't mind. I received these sheets today. I’m popping them in the washing machine so my grandson can sleep on them tonight. They are cute and hopefully comfy. "What are the 3 pieces that are included? What’s the thread count?"